(Skip to the bottom of this post if you would rather read the whole original essay in Norwegian). Software is no longer only a tool. It is a product in its own right, and project work is what produces it. Svada (Norwegian word a bit like claptrap): A field of knowledge that consists of obivous'ites and only exists for the purpose of its own consultants. There were times [in the project] where I saw lack of management, and again I hungered to take control of the project to get the work going. I wonder whether this need was rooted in my task-oriented, or self-oriented self. The task-oriented part wanted control to get the job done, wile the self-oriented part wanted to put me in the hero-role so others could see my skill. It is a well known fact that extensive requirement specifications and customer interaction is necessary for a successful product. We have [with our project] confirmed this yet again. Even though it can be useful to re-use existing resources and design, it is healthy to engage upgrades of IT-systems as entire new projects. It is within the complex nature of project work that a comprehensive and documented plan is necessary. The project plan should be the project group's bible. It should be a reference guide and framework for all things regarding control, activities and mangement in the project. It is easy to speculate on what a project plan should contain, and one often ends up with a project plan containing a lot [of stuff]. There is a trend of plans growing so heavy that they are ignored as soon as they are complete. The project team believes that the plan contains a series of obvious facts that are only relevant for management and customer, and feel no ownership in the document. The implementation phase is often experienced to be the biggest part of the project. It is then one actually makes the product. While being a concrete and actual task, it is still very unclear in the beginning. By the completion of the product, it is odd how clear the approach was when one looks back to the start. Implementation never goes as expected. It is like finding the easiest way out of a circle drawn up by the analysis [earlier project phase], and naturally one follows the radian directly outwards. The larger reqirements and analysis, the larger the circle becomes. Throughout the implementation, the developers analyze deeper and extend the requirements on their own. 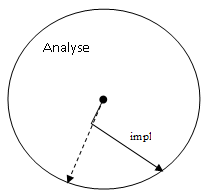 The analysis [circle] will grow and move depending on how thorough the original analysis was. Often it will become appearant that another angle out of the circle (meaning different technology or architecture) will be shorter, and in the worst case, especially early on in the implementation, one has to turn around entirely to follow another direction [out of the circle]. The essay contains some glorification of the project as a working structure, and the project manager her/himself. I drew a prallell from the project manager to ancient human traditions of tribal leaders, and how a project manager appeals to our natural order. A practical assignment demonstrated that the team was actually less efficient when all had insight into the orchestration of a task. Today I'm not so certain we should prominate the project manager as the leader role it is set out to be. Scrum trainers have on several occasions claimed that there is no place for project managers in agile projects.. but that is all thought for another blog post. Expectations should not be built too high, but the team should be made aware that the project will demand full attention, so they anchor their devotion to a high level. Humans have different motivations. Their true roles should be discovered so they can receieve proper motivation and fitting tasks in the project. The mission must be well studied/understood. Stable customer contacts and project management must be used in the customers best interest to achieve the best product. The plan requires quality over quantity. A good plan is used continously by management from start till finish. Implementation is the goal of the project and can quickly become the hardest part. The team will find themselves within valleys of shadow [dødsskyggedaler], and it is important for the project manager to involve her/himself, maintain motivation and synchronize development with the requirements of the customer. The end of the project should be emphasized. Before the team is disbanded, they should analyze their experiences and document what knowledge they have acquired throughout the project. Leadership demands a person with a multitude of talents. She/he must be fully focused on the project. Both the team and external actors must be duly stimulated for the project to succeed. It is important to remember that we do not use this form of management [meaning project] for its own sake, but because it brings out the most productive in humans. Projects are our generation's way of organization for system development. It is important that we prepare ourselves for the real world by doing projects in a realistic atmosphere so we may experience that leadership is important, and not just another chapter in a textbook. "Teaching has suffered greatly from having being locked up in Universities and expelled from the World and good Company." Very fitting end to an essay I handed over to a professor, don't you think? Mind that the Hume quote is doubly translated back from Norwegian because I couldn't find the original source right now. For those who wish to read the essay in Norwegian, it's available on Scribd. Was this an elective course that you chose? I find it interesting that in Europe Project Management is taken very seriously to the point that some private high schools teach Project Management for their students. I have recently published an article written by a Project Manager in Austria teaching Project Management to teenagers, here's the article: teaching project management to students: objectives and benefits. Well, the course was mandatory for my particular studies (5 year long "profession" study). It's possible to get through uni without taking a course on PM, I suppose, but most schools and uni will have some classes that relate to that field. Personally, (although it's a point that deserves an entire article for defence) I believe that the project form is a bit overrated as the optimal organization structure/process for developing software. I prefer more evolutionary development processes where teams grow and shrink organically. Classic projects are way too much *boom*-*deliver*-*gone*, and leaves to much maintenance chaos in its wake. Even though students should learn PM, they should also be taught more pragmatic and agile practices.